Virtually all utility executives believe the industry's century-old business model is changing and that utilities need to adapt. Where there’s less consensus is around how. Only 3 percent of utility executives said they believe their company's business model does not need to change, according to a recent survey conducted by Utility Dive. The results stem from an online poll of 515 U.S. electric utility executives conducted at the end of 2015 and the beginning of 2016. So there’s a near consensus on the need to evolve, which goes for all utility types -- investor-owned utilities, municipal utilities, public power agencies and electric co-operatives. But respondents see several hurdles in the way. The report notes that the 21st century has seen the emergence of the smart grid, renewable portfolio standards, federal carbon regulations and new disruptive market players, among other factors. And yet, while new challenges have emerged, the survey found that legacy issues continue to dominate, with utility executives citing an aging workforce, outdated regulatory models and aging infrastructure as the most pressing challenges facing their company. These issues have long plagued utilities, but they’re arguably exacerbated by changes in the energy system. The falling cost of renewables and increased availability of distributed energy resources (DERs), like rooftop solar and energy storage, are driving concerns around load reduction and cost recuperation. Investor-owned utilities are particularly concerned that their regulatory models will not serve them well in this changing environment. Next to legacy issues, renewable energy integration and stagnating load growth were cited as some of utility executives' top concerns. For many utilities, DERs present a particular set of opportunities and challenges. Choosing from among a suite of advanced clean energy technologies, 66 percent of utility executives said they are currently most invested in utility-scale solar and wind, 64 percent said demand-side management and 50 percent said distributed generation. Out of the technologies they felt they should invest in more, energy storage rose to the top, with 65 percent of utility executives reporting this as a priority. Distributed generation was second at 52 percent and utility-scale solar came in third at 47 percent. These responses track last year’s Utility Dive survey, in which 56 percent of respondents said that DERs presented an opportunity, but at that time, executives were unsure how to build a business model around them. This year, utility respondents clearly favored two approaches: partnering with third parties to deploy DERs and installing DERs by rate-basing investments through the regulated utility. When respondents were offered five DER business models and asked to select all that apply, the results show 60 percent of utility executives believe they should partner with third parties and 59 percent believe they should rate-base their investments. Some utility respondents (39 percent) were open to procuring or aggregating power from DERs owned by third-party providers, and others (29 percent) were open to owning and operating DERs through an unregulated subsidiary. Very few (5 percent) said they do not believe their utility should have a business model around DERs. 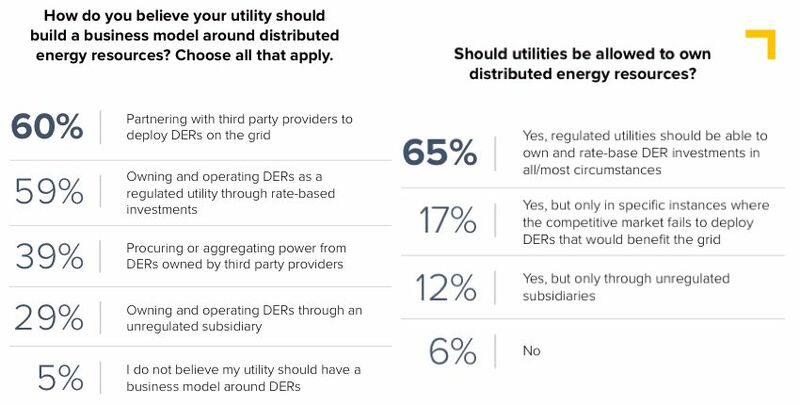 Because the choices aren’t mutually exclusive, responses show that utilities are considering and possibly pursuing multiple DER business models, which is likely a reflection of regulatory uncertainty. In the Utility Dive survey, when asked specifically if regulated utilities should be allowed to own and rate-base DERs, a strong majority of respondents -- 65 percent -- said that they should. Another 17 percent said utilities should be able to rate-base DER investments, but only when the competitive market fails to deploy DERs that would benefit the grid, which is the model put forward by regulators in New York. Only 12 percent of respondents said they should offer DERs through an unregulated subsidiary, and just 6 percent said utilities shouldn’t offer DERs at all. The notion of utilities owning and recuperating costs for DERs is the subject of heavy debate. National solar companies view allowing monopoly utilities with a pre-existing customer base to participate in the DER market as anti-competitive. There’s also no precedent, as to date, very few regulated utilities have sought to deploy DERs. 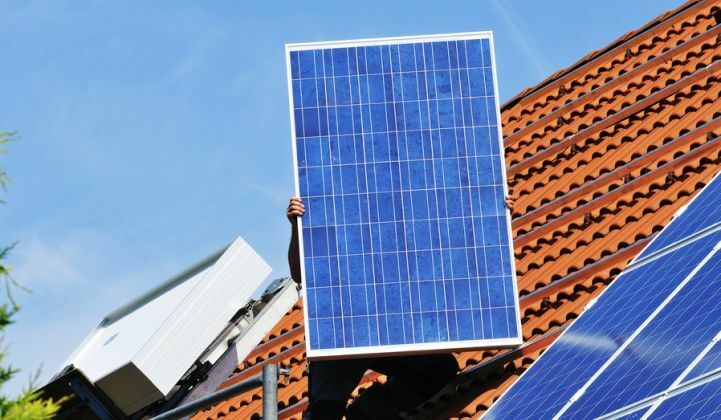 However, Arizona Public Service and Tucson Electric Power were recently given regulatory approval to launch residential solar pilot projects, and other utilities, such as Georgia Power, have begun offering rooftop solar through their unregulated utilities. How these and other utility-owned DER programs evolve is likely to remain a hot-button issue in the industry. For utilities, the rapid growth of third-party-owned DERs creates a necessity to reform rate structures to compensate for lost revenues. “While the sheer volume of electricity sales lost to DERs in most regions of the nation is still small, stagnant or declining load growth can make even small increases in DER penetration significant for utility earnings,” the report notes. Few utilities see lowering net metering credits for DERs as the sole solution. To solve the issue of decreasing revenue, most utility executives (38 percent) believe they need to adjust rates through fixed charge increases, demand charges and time-of-use rates. If not through rates, many utility executives (27 percent) believe they should offer their own renewable energy options, such as green pricing or community solar programs. Among the possible rate-change options, a majority of respondents (55 percent) favored instituting time-of-use rates to charge more at peak times. The second and third most popular options were to increase fixed charges (29 percent) and increase demand charges (28 percent), respectively. The answers surrounding rate reforms were not mutually exclusive, which indicates that utilities are pursuing multiple approaches. “If there’s one overarching takeaway from Utility Dive’s third annual State of the Electric Utility industry survey, it’s that the transformation has arrived -- but a standardized approach on how to adapt to it has not,” the report states. Utilities see clean energy and grid-edge technologies changing the way they operate, and they increasingly want to get in on the game, although it's not clear what their role will be. There's no doubt that non-utility players will have input on how that process unfolds. But, ultimately, the decision rests with regulators and policymakers -- as the recent Nevada solar controversy has shown. Interestingly, despite often-stated concerns over the potential for DERs to erode utility revenues by reducing load, the notion that customers will generate and store enough of their own power to abandon the grid -- a trigger of the so-called utility death spiral -- appears to be a relatively small concern in the grand scheme of things. 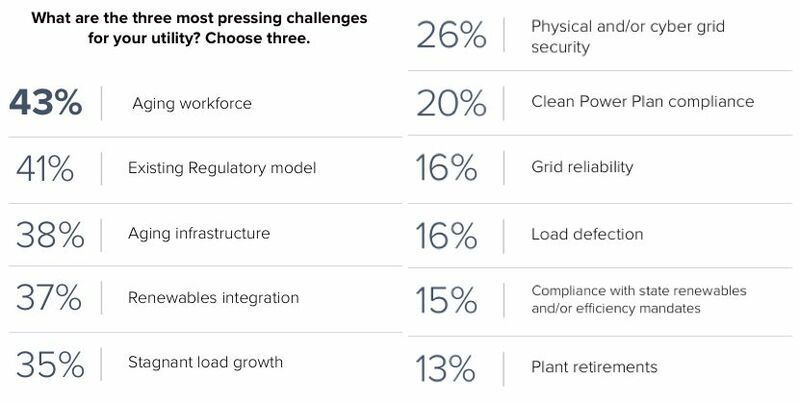 Just 16 percent of utility executives see load defection as one of the top challenges facing their industry.